FIX: Windows 10 Not Shutdown Completely. The following problem appears on a Windows 10 based computer after installing updates: Windows 10 not shutdown completely after choosing 'Shutdown' from 'Power' options menu. More specifically, the screen goes black, but the machine does not power off, with all the indicator lights (power, wifi, keyboard, etc.) remain on and the only option to fully shutdown the machine, is to press the power button for 5-7 seconds (force shutdown). This tutorial contains several methods to fix the "Windows Not Fully Shutdown" issue on Windows 10, 8 or 8.1. How to fix: Windows 10 Not Completely Shutdown . Method 1. Disable Fast Startup. 2. Click to open Power & Sleep settings. 4. Select Choose what the power buttons do at the left. 5. Then click the Change settings that are currently unavailable option. * Note: If the fast start up option was already unchecked, then check it and restart your computer. After restart uncheck it and restart your computer again. 2. Click to open Command Prompt. 3. At command prompt give the following command and press Enter. 4. Now try to shutdown your computer. Method 3. Roll Back the driver for the Intel Management Engine Interface. 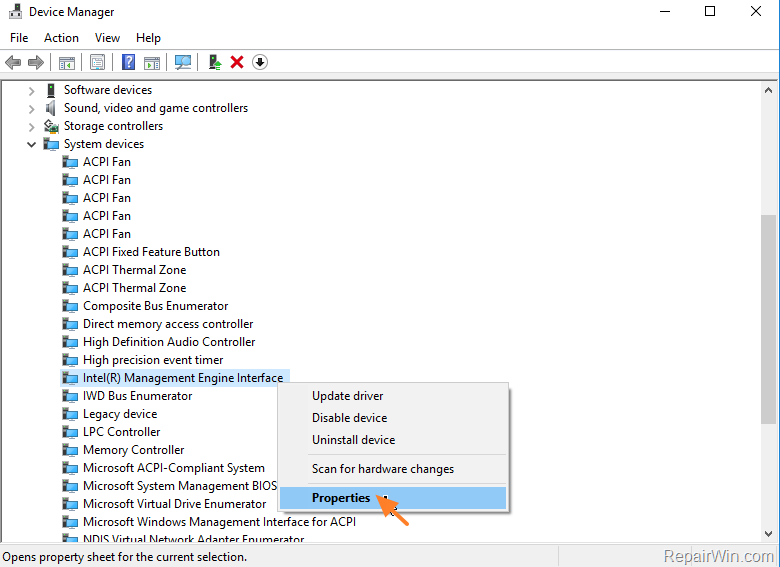 If you own a laptop or motherboard with Intel chipset, then proceed and rollback the driver for the Intel Management Engine Interface. 2. Type: devmgmt.msc & click OK.
4. Right click on Intel Management Engine Interface and select Properties. 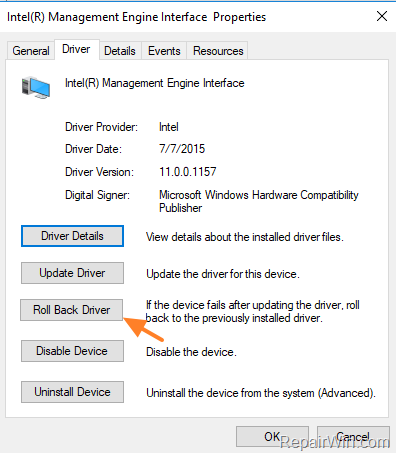 * If the Roll Back Driver button is greyed out, then navigate to your laptop's or motherboard's manufacturer support site to download and install an older driver version for the Intel Management Engine Interface. Method 4. Modify Power Settings on Network Adapter. The final method to fix Windows 10 shutdown problems is to modify the power settings for the network adapter. 3. Right click at the installed network adapter and select Properties. 4. 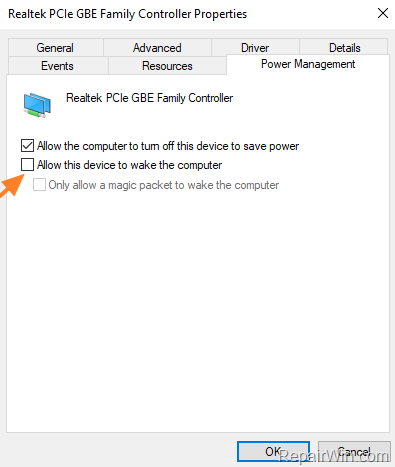 Uncheck the 'Allow this device to wake the computer' checkbox and click OK.
5. Try to shutdown your computer.